Be the first to share your favorite memory, photo or story of Bearl. This memorial page is dedicated for family, friends and future generations to celebrate the life of their loved one. FLETCHER, Bearl J. 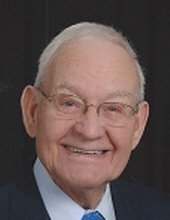 - Age 93, of Swartz Creek, died Thursday, September 13, 2018. Funeral services will be held 11:00 AM Saturday, September 15, 2018 at Cornerstone Baptist Church, 6273 Miller Road, Swartz Creek. Pastor Aaron Whitman officiating. Burial in Crestwood Memorial Cemetery, Grand Blanc. Visitation will be held at Sharp Funeral Home and Cremation Center, 6063 Fenton Rd., Grand Blanc Twp. Friday from 4-8 PM and at church Saturday from 10 AM until the time of the service. In lieu of flowers, those desiring may make contributions to the family. Bearl was born April 15, 1925 in Paragould, AR. He married Inge Anna Schmitt March 20, 1993 in Flint. He retired from GM Chevrolet V-8 Engine Plant. He was a member of Cornerstone Baptist Church and the U.A.W. Local 659. Surviving are: his wife, Inge; daughter, Maria (Tim) Leemhuis; grandchildren, Ryan Drouillard, Mike (Dana) Fletcher, Terry (Michelle) Fletcher, and R.D. Fletcher; sisters, Dorothy Brown and Mary Smith; brother, Johnny Fletcher; and several nieces, nephews, and friends. He was preceded in death by his parents; first wife, Vernice; sons, David and Ruben Fletcher; grandchildren, BabyJoey and Shawn; brothers, George, Bobby, and Lee; and sister, Omeda. To send flowers or a remembrance gift to the family of Bearl J. Fletcher, please visit our Tribute Store. "Email Address" would like to share the life celebration of Bearl J. Fletcher. Click on the "link" to go to share a favorite memory or leave a condolence message for the family.